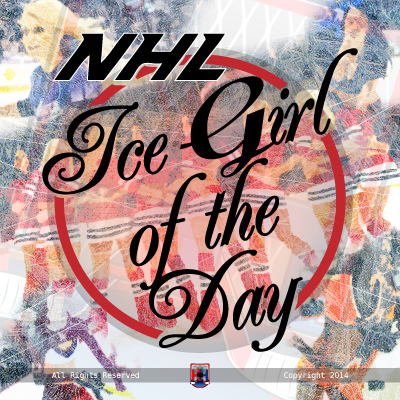 Columbus Blue Jackets Ice Girl Cyara. A: Honestly, I really got in to hockey when I began skating on the Blue Jackets Ice Crew three years ago. I was a figure skater for about thirteen years prior to joining the Ice Crew, I have cousins and friends who play hockey and saw my fair share of hockey practice and games while training at the rink, but I never truly appreciated the spirit of the game until I became engrossed in the community! A: I’m a second year law student at OSU, so I’m pretty busy! In my down time I enjoy reading (I devoured Game of Thrones), going to concerts, and binge watching TV series – particularly Wilfred and Archer! I also have my BA in Philosophy and love a good debate! 5) What’s the funniest thing about being an NHL Ice Girl? A: The first year I was on the Ice Crew they had the promo team members throw T-shirts into the stands before games. I have no arm and could hardly ever make it over the glass! Perhaps not as funny to me as it was to everyone else…Otherwise, there is never a dull moment on the Blue Jackets promo teams. My coworkers and employers are such an entertaining, energetic bunch – going to work is always a blast! A: I have some friends playing on club teams and intramurals and would love to join them. However, being on the Ice Crew has made me respect the difficulty of the sport, I’m not sure if I’m coordinated enough to be up to the task! A: Three so far, I’m trying out for the 2014-15 season so hopefully four! A: The community. Our fans are incredible, my employers and coworkers are extremely supportive, and the players are such an inspiration! A: If the whole attorney thing doesn’t pan out, Ice Cream Taste Tester would be a nice alternative. Cyara of the Columbus Blue Jackets.